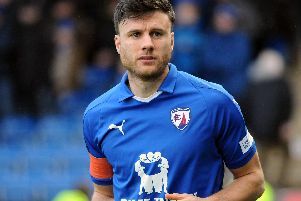 Charlie Raglan has signed a one-year extension to his Chesterfield contract, which ties him to the club until the summer of 2017. The defender, who was recruited from FC United of Manchester in April 2014, made 25 appearances last season. He said: “I’m delighted to have got everything sorted out just before the start of the season. I’ve enjoyed my time at the club and I’m really happy here. The announcement follows the captures of Alex Cairns, on a short term deal until January 2, Dion Donohue, on a 12-month contract, and Jake Orrell, also on a one-year deal.